The Capitals defenceman surprised local kids to present 25 sets of hockey equipment. Wednesday afternoon at the Bowie Ice Arena in Maryland, Washington Capitals defenceman Brooks Orpik and the NHLPA Goals & Dreams (G&D) program surprised a group of 14 kids from the Tucker Road Ducks to present G&D’s donation of brand new hockey equipment – culminating many months of correspondence between the NHL defenceman, the players’ charitable program and the youth hockey organization. Last January, the Tucker Road Ice Rink unfortunately had to close due to a two-alarm fire, which also destroyed the organization’s hockey equipment. Orpik heard about this story and contacted the Tucker Road Parent Hockey Organization to offer assistance. “We received an outpouring of support from across the country. When this news reached Brooks Orpik, of the Washington Capitals, he reached out to ask what can he do to help. That is when he told us about the NHLPA Goals & Dreams and connected us to the right people,” said Alexandria Briggs-Blake, President of Tucker Road Parent Hockey Organization. Last April, while his Capitals were in the midst of a first round playoff series versus the Maple Leafs, Orpik stopped by the NHLPA office in Toronto on an off day between games three and four to speak with Devin Smith and Matt Langen about Tucker Road’s recent loss and to see how the two organizations could work together. In November, Tucker Road announced it had received a donation of 25 complete sets of new hockey equipment from G&D, and this week he surprised the kids by personally stopping by to give them their new gear. “After outlining what the Tucker Road Ducks organization has accomplished over the past three years and is going through since the arena fire, G&D was very interested and I am excited we can assist them,” Orpik said. Due to the arena fire, Tucker Road has been forced to rent ice time in a few different local rinks while they target the fall of 2019 to reopen their arena. Last season, Monumental Sports & Entertainment Foundation – the Washington Capitals’ charitable arm – also donated $5,300 to Tucker Road, which the program used ice rentals. 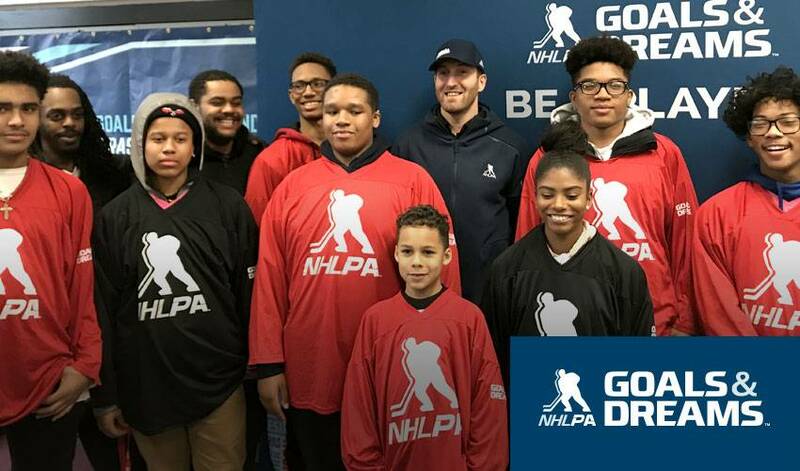 Despite the challenges faced over the last year, the love of the sport for the young hockey players – who range in ages from 7 to 16 years old – hasn’t waned, as shown by their excitement in meeting Orpik. Many of the excited kids eagerly asked questions of Orpik about his playing experiences, and each of the Tucker Road kids had the opportunity Wednesday afternoon to get their picture taken with him, while they also received his autograph, as well as some of that new hockey equipment. Briggs-Blake and her team will soon finish allocating sizes and equipment for each kid in their program before distributing it further. Tucker Road already has plans to use this new hockey equipment from G&D to kickstart an equipment loaner program so they can outfit their kids with everything they need to play the game. The Tucker Road Ducks Parent Hockey Organization began in 2014 at Tucker Road Ice Rink located in Fort Washington, Maryland. Since that time, the program has continued to grow and compete with other regional hockey teams and in tournaments. Each year, the TRPHO continues to advance its mission to provide children with the opportunity to learn and play ice hockey regardless of their socio-economic status, with many youth lives having been improved. The health and physical benefits of ice hockey skating help youth make good decisions on the ice, which translate into the classroom and everyday life.